When the unthinkable first happened, it was early on a Saturday and I’d just woken up. “Benjie, it’s Nate,” the voice on my cell phone said. Nate and I were working an important wedding in about 8 hours. It was his last wedding with us for a while; we’d left a big hole in his work schedule this year because his wife was due to have a baby in 6 weeks. Nate’s wife was in labor. Six weeks early. So exciting! But he couldn’t work tonight’s event. That’s how I learned my lesson. What if the DJ has a car wreck just before your wedding? What if the DJ has a (possibly contagious) illness on your wedding day? What if the DJ loses a family member and has an out-of-town funeral on your wedding day? What if, like Nate, the DJ adds a family member on your wedding day and kind of needs to be in the delivery room with his or her spouse? Let’s be clear; you’re REALLY unlikely to experience anything like the above on your wedding day. But it’s not impossible. My company’s got more than 1000 events under its belt – and in that time we’ve more or less experienced them ALL. We all take our jobs pretty seriously, which means we take your wedding pretty seriously. As Backthird was growing, we realized a day could come – in theory, anyway – when we weren’t able to fulfill a contract with one of our couples. And we weren’t ok with that thought. So we built a pretty simple secret weapon. We pay a DJ to stay home. Backthird’s On Call DJ system is exactly what it sounds like: Every day our company books a wedding DJ, we also pay a second DJ – to stay home. Your On-call DJ will stay local, stay available and stay sober until your lead wedding DJ’s setup time has come and gone. In the event of a major emergency, your lead DJ calls in and we “activate” your On-call DJ. He or she takes over where your lead DJ left off – with all the plans and requests you’re already worked out with your lead DJ, if possible. Most of the time, the On-call DJ has a nice night off with friends and family. But if “the unthinkable” takes place, he or she is one call away. That’s what we do if your DJ has an emergency on your wedding day. So what do YOU need to do if a DJ emergency arises? The On-call DJ system is built into our standard wedding DJ pricing. We never work a wedding that isn't important, so we'll never work a wedding without a DJ on call. You’ll have a DJ at your wedding. No ifs, ands or buts. Your DJ will be a certified, experienced Backthird DJ. On-call DJs are NOT posers we find on Craigslist – they’re current and former Backthird DJs. They’re the same men and women who work weddings for us every weekend. You’ll know about any changes as soon as we do. If your DJ has an emergency on your literal wedding day, the On-call DJ will let you and your vendors know what’s going on upon arrival at your wedding site. 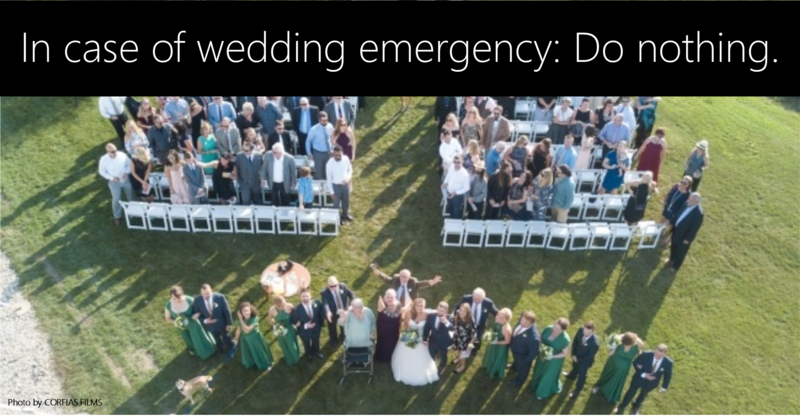 Most emergencies DON’T actually happen right before your wedding. The most common types of problems happen with a few days’ notice: The out-of-town funeral that gets scheduled on Thursday for Saturday, or the crippling (and contagious) stomach bug that settles in Friday but is going to last for several days. If that’s the kind of emergency your DJ has, you’ll know as soon as we do. So you’ll still get the chance to chat with your On-call DJ and make sure things are in order before your wedding day begins. Our DJs love their jobs, and they take those jobs pretty seriously. Once we match you with a given DJ, there’s not much he or she wouldn’t overcome to follow through on that commitment to you. Which is why emergencies like I’ve described in this post are so rare. How rare? In my experience, the kind of emergency that would require an On-call DJ crops up 3 or 4 times out of every 1000 events. So basically, it’s not going to happen to you. But if it does… Isn’t it nice to know your wedding’s going to be great anyway?